Hey dolls! I hope you are all enjoying your Saturday evening. A few weeks ago, CVS was having a 75% off sale on select Milani products. When I stopped by my local CVS store to check it out, sure enough, the selection that remained, consisted of items that I wouldn't normally pick up for myself. That always happens to me. I think its because I always wait until the last minute to go check out the sales. By the time I finally get to the store, the display is destroyed and almost all of the sale items are gone. But, I digress. I was almost certain that I was going to go home empty handed but I decided to check out the lipsticks and see what I could find. 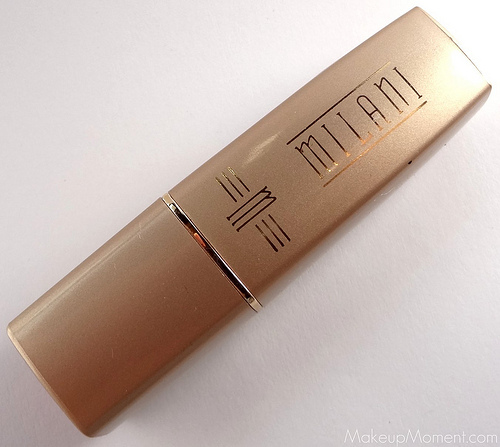 I had never tried Milani lipsticks so, I was hoping I would find a shade that I could try out. Well, what do you know? 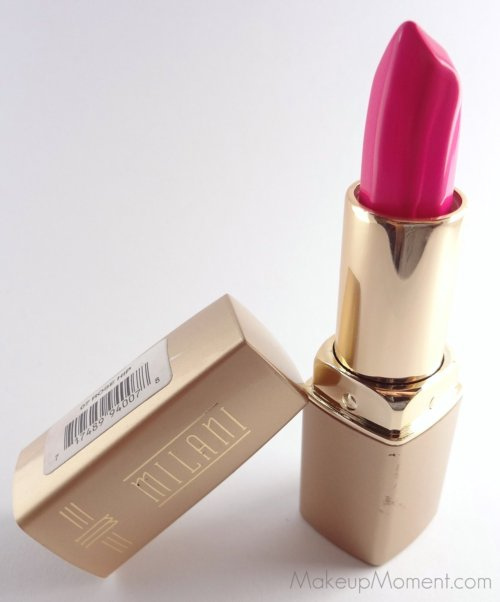 I found one Milani lipstick shade that was right up my alley, and her name is Rose Hip. This lipstick originally retailed for $6.39 at my local CVS. Take off 75% of that and my total came up to $2.79! What a steal! By the way, I am not sure if the 75% off sale is still going on. But, I would suggest stopping by your local CVS and checking out the Milani display, to see if the 75% off stickers are still on the selected products. Rose Hip is a creamy, muted bright pink. It is bright, but not quite neon-bright. Either way, this lip color sure makes a gorgeous statement when applied to the lips. Rose Hip felt super creamy going on. Not to mention smooth. I got opaque coverage in no time and the formula felt really comfortable on my lips. The finish is creamy (obviously, I am obsessed with continuously using the word creamy when it comes to this post) and, it leaves an impeccable shine that makes layering a gloss on top, optional. I haven't worn this lip color out yet so, I can't comment on the lasting power. But, since creamier formulas tend to wear off quicker for me, I am going to rough guess and say that this lip color would probably last somewhere between 4-6 hours on me. This lipstick does contain a fragrance. I can't quite describe it but I know that I am not very fond of it. Luckily, the smell quickly dissipates once the lipstick is applied to the lips. 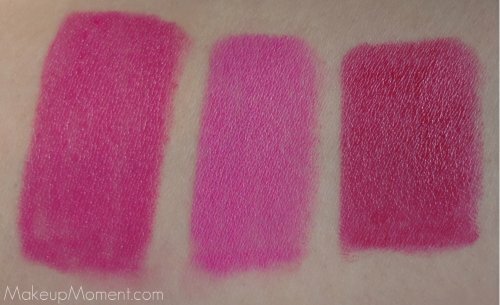 I have a few pink lipsticks in my makeup stash and I was curious to see if Rose Hip could actually be a dupe for any of my pink MAC lipsticks. Don't get me wrong, I adore my MAC lipsticks but, I am all for finding more affordable options. While thinking about a possible MAC lip color that was similar to Rose Hip, I immediately thought of MAC's Candy Yum-Yum lipstick. It was a limited edition lipstick that was highly coveted by all bright pink lipstick lovers. I am still mad at myself for not picking up any back-ups. Meanwhile, I am trying to sparingly use the one tube of Candy Yum-Yum that I do have. One can only hope that MAC releases it again. Anyways, Candy Yum-Yum is a super bright, neon pink and since Rose Hip was also on the bright side, I figured they would be similar. But that was not the case when I swatched both lip colors side by side. Obviously, Candy Yum-Yum is much more cool toned and brighter than Rose Hip. So, I dug back into my lipstick stash and pulled out Girl About Town lipstick. Both Rose Hip and Girl About Town are a tiny bit similar, but not enough, that I would classify them as exact dupes of each other. Rose Hip is cooler and brighter than Girl About Town. Girl About Town is much more deeper and warmer. 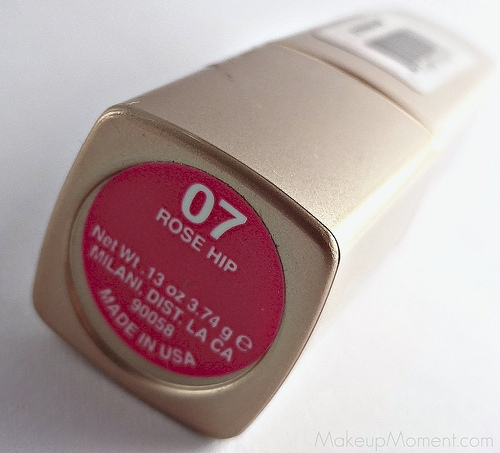 Overall, I love pink lipsticks so it is no surprise that I really adore Milani's Rose Hip lipstick. I can't wait to rock this lip color with a neutral eye and a heavy winged out liner. Super pretty! If you live for bright pink lipsticks that are creamy, and make a bold statement, Rose Hip is definitely a lip color that is worth a look. 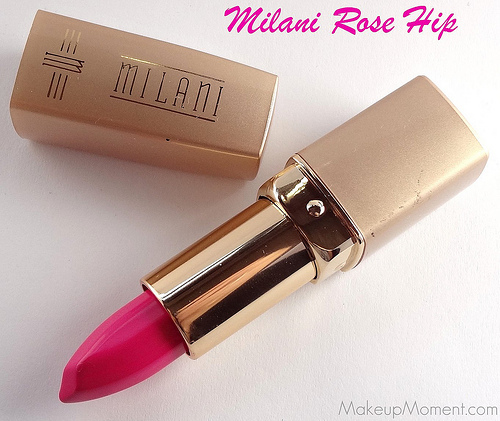 What do you all think of Rose Hip lipstick by Milani? Did any of you pick up this lip color? Disclaimer: I am not affiliated with any of the companies mentioned above. I purchased all of the products mentioned above for my personal use. This is a very pretty lip color. Thanks, Jazmin :) Have you tried any lipsticks from Milani before? i love milani lipsticks! they have great pigment for such a good price. this one looks like nicki minaj new mac lipstick. Alina, this lipstick shade is sooo gorgeous. Im drooling over the swatch. I would spot this color for Summer!